Every collection has to start somewhere, and for Lisa Congdon, it began with a dish. Nearly ten years ago, the San Francisco–based artist (and co-owner of local design shop Rare Device) picked up a piece of Cathrineholm enamelware at a flea market, drawn to its bold hue and simple pattern. After researching the piece’s provenance, she began scouting garage and rummage sales for similar items. “I try not to buy on eBay, because I like the challenge of finding each piece and the story that goes along with it,” she explains. The kitchen has incorporated Congdon's collections and Walsh's minimalism to achieving a bright balance between form and function. Part of the thrill of collecting is finding treasures in unexpected places. Congdon came across a five-piece Cathrineholm canister set with teak tops at a rummage sale in Maine, and made off with the quintet for a cool $2. Collections abound in Congdon's kitchen (and home), and while a few of her pieces are for decoration only, most are there to be used, too. Here, mugs and napkin rings are arranged, and at the ready. The island gets a lot of action. Pots and pans are stored below on one side, seating is lined up on the other, and food prep and art projects all congregate in the center of the kitchen. Installing an IKEA island helped the kitchen become far more than a functional room for food preparation. The windows provide some of the best natural light in the house so oftentimes, Congdon will clear the fruit bowl away and use it as a workspace for sewing or drawing projects. Cooking has become far more frequent for Congdon since she became a full-time artist and co-owner of the brilliant San Francisco boutique Rare Device, and her partner Clay Walsh moved in. Congdon purchased Bird Pear, a silkscreen by Heather Amuni-Dey, at Super 7 in San Francisco's Japantown. A few functional changes have helped make the most of the available space in the kitchen. Congdon and Walsh installed a shelving unit underneath the plate wall last year, which gave them a handy place to store their dry goods and cookbooks. Flea markets and thrift stores were gold mines for finding the plates Congdon used—to great effect—to adorn the kitchen wall. 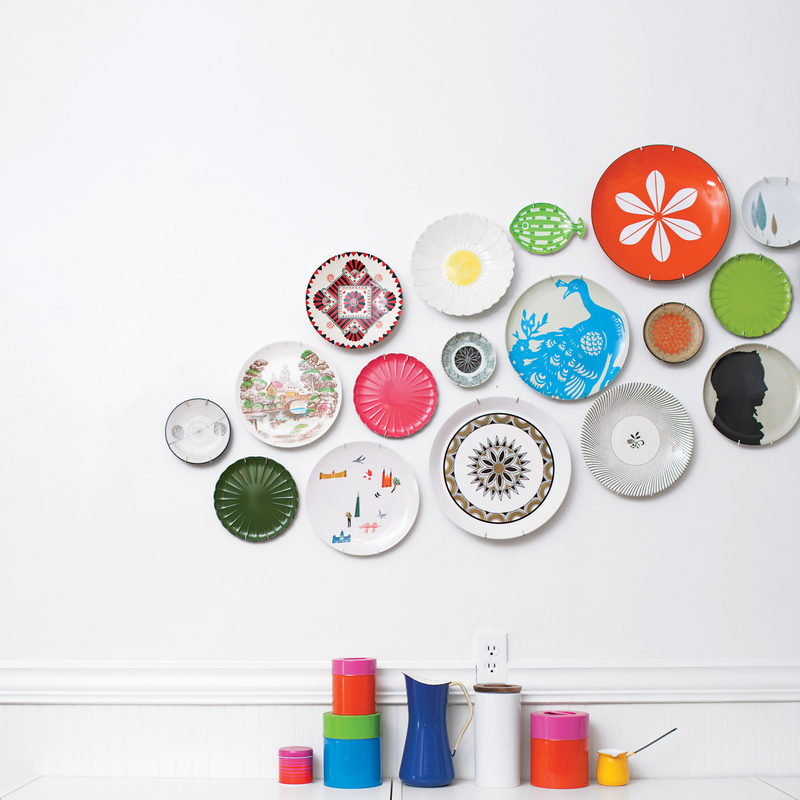 The kitchen in Congdon’s Mission District apartment provided an obvious home for her crockery. But it wasn’t until her more minimalist partner, Clay Walsh, moved in and incorporated her own functional and unfussy touches—–glass shelves, white walls, an Ikea island—–that the space became truly livable. Balancing equal measures of form and function suited their newly shared space. “The kitchen used to be the place to just display these beautiful things, and now we love spending time in here, too,” says Congdon.